Why Is It Important to Assess Cognitive Impairment in Older Adults? How Can Physicians and Staff Find Time for Screening? How Is Cognitive Impairment Evaluated? As a primary care practice, you and your staff are often the first to address a patient’s complaints—or a family’s concerns—about memory loss or possible dementia. (1,2) This quick guide provides information about assessing cognitive impairment in older adults. 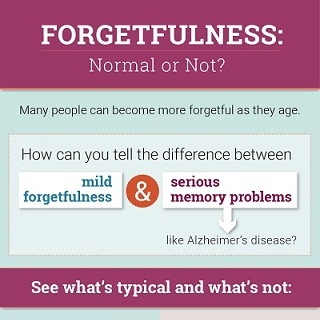 Read and share this infographic to learn whether forgetfulness is a normal part of aging. Cognitive impairment in older adults has a variety of possible causes, including medication side effects, metabolic and/or endocrine derangements, delirium due to intercurrent illness, depression, and dementia, with Alzheimer’s dementia being most common. Some causes, like medication side effects and depression, can be reversed with treatment. Others, such as Alzheimer’s disease, cannot be reversed, but symptoms can be treated for a period of time and families can be prepared for predictable changes. Most patients with memory, other cognitive, or behavior complaints want a diagnosis to understand the nature of their problem and what to expect. (6-10) Some patients (or families) are reluctant to mention such complaints because they fear a diagnosis of dementia and the future it portends. In these cases, a primary care provider can explain the benefits of finding out what may be causing the patient’s health concerns. Read tips on Talking with Older Patients About Cognitive Problems. Pharmacological treatment options for Alzheimer’s-related memory loss and other cognitive symptoms are limited, and none can stop or reverse the course of the disease. However, assessing cognitive impairment and identifying its cause, particularly at an early stage, offers several benefits. If screening is negative: Concerns may be alleviated, at least at that point in time. Trained staff using readily available screening tools need only 10 minutes or less to initially assess a patient for cognitive impairment. While screening results alone are insufficient to diagnose dementia, they are an important first step. The AD8 (PDF, 1.2M) and Mini-Cog (PDF, 86K) are among many possible tools. Assessment for cognitive impairment can be performed at any visit but is now a required component of the Medicare Annual Wellness Visit (PDF, 565K). (4),(13) Coverage for wellness and, importantly, for follow-up visits is available to any patient who has had Medicare Part B coverage for at least 12 months. A primary care provider may conduct an evaluation or refer to a specialist such as a geriatrician, neurologist, geriatric psychiatrist, or neuropsychologist. If available, a local memory disorders clinic or Alzheimer’s Disease Center may also accept referrals. Genetic testing, neuroimaging, and biomarker testing are not generally recommended for clinical use at this time. (2),(15) These tests are primarily conducted in research settings. Interviews to assess memory, behavior, mood, and functional status (especially complex actions such as driving and managing money(16)) are best conducted with the patient alone, so that family members or companions cannot prompt the patient. Information can also be gleaned from the patient’s behavior on arrival in the doctor’s office and interactions with staff. Note that patients who are only mildly impaired may be adept at covering up their cognitive deficits and reluctant to address the problem. Family members or close companions can also be good sources of information. Inviting them to speak privately may allow for a more candid discussion. Per HIPAA regulations, the patient should give permission in advance. An alternative would be to invite the family member or close companion to be in the examining room during the patient’s interview and contribute additional information after the patient has spoken. Brief, easy-to-administer informant screening tools, such as the short IQCODE or the AD8 (PDF, 1.2M), are available. Other risk factors that could indicate the need for dementia screening include: low education, history of type 2 diabetes, stroke, depression, and trouble managing money or medications. Instruments for brief screening are available and can be used in an office visit. Patients, particularly those who express a concern, likely want to know what the underlying problem is. Refer to a specialist if needed. 1. Bunn F, Goodman C, Sworm L, et al. Psychosocial factors that shape patient and carer experiences of dementia diagnosis and treatment: a systematic review of qualitative studies. PLOS Med. 2012;9(10):e1001331. 2. Galvin JE and Sadowsky CH. Practical guidelines for the recognition and diagnosis of dementia. J Am Board Family Med. 2012;25(3):367-382. 3. Chodosh J, Petitti DB, Elliott M, et al. Physician recognition of cognitive impairment: evaluating the need for improvement. J Am Geriatr Soc. 2004;52(7):1051-1059. 4. 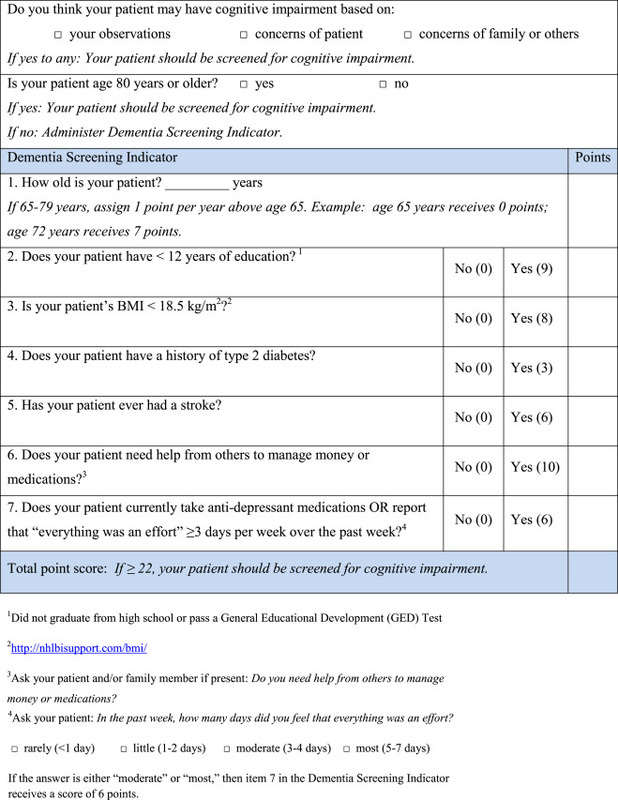 McPherson S and Schoephoester G. Screening for dementia in a primary care practice. Minn Med. 2012 Jan;95(1):36-40. 5. Bradford A, Kunik M, Schulz P, et al. Missed and delayed diagnosis of dementia in primary care: prevalence and contributing factors. Alzheimer Dis Assoc Disord. 2009;23(4):306-313. 6. Boustani M, Peterson B, Hanson L, et al. Screening for dementia in primary care: a summary of the evidence for the U.S. Preventive Services Task Force. Ann Intern Med. 2003;138(11):927-937. 7. Weimer DL and Sager MA. Early identification and treatment of Alzheimer disease: social and fiscal outcomes. Alzheimers Dement. 2009;5(3):215-226. 8. Connell CM, Roberts JS, McLaughlin SJ, et al. Black and white adult family members’ attitudes toward a dementia diagnosis. J Am Geriatr Soc. 2009;57(9):1562-1568. 9. Elson P. Do older adults presenting with memory complaints wish to be told if later diagnosed with Alzheimer’s disease? Int J Geriatr Psychiatry. 2006;21(5):419-425. 10. Turnbull Q, Wolf AMD, Holroyd S. Attitudes of elderly subjects toward “truth telling” for the diagnosis of Alzheimer’s disease. J Geriatr Psychiatry Neurol. 2003;16(2):90-93. 13. Cordell CB, Borson S, Boustani M, et al. Alzheimer's Association recommendations for operationalizing the detection of cognitive impairment during the Medicare Annual Wellness Visit in a primary care setting. Alzheimers Dement. 2013 March;9(2):141-150. 14. Holsinger T, Deveau J, Boustani M, et al. Does this patient have dementia? JAMA. 2007;297(21):2391-2404. 15. McKhann GM, Knopman DS, Chertkow H, et al. The diagnosis of dementia due to Alzheimer’s disease: recommendations from the National Institute on Aging–Alzheimer’s Association workgroups on diagnostic guidelines for Alzheimer’s disease. Alzheimers Dement. 2011;7(3):263-269. 16. Marson DC. Clinical and ethical aspects of financial capacity in dementia: a commentary. Am J Geriatr Psychiatry. 2013;21(4)382-390.